First and foremost, with any point-of-care tool, reliability is key and in addition to all of these This app is from a reputed developer that employs over 100 practicing physicians on its editorial board to update its digital medical image collection, which numbers over 18,000 on this app. Logical Images, Inc (Rochester, NY) is a reputed medical technology company that has developed the world’s largest digital medical image library that includes over 60,000 images of visually presenting diseases (18,000 on this app). We previously featured a conversation with Dr. Art Papier, Co-Founder and Chief Scientific Officer of Logical Images (posted March 4, 2010). As mentioned in this conversation, the NIH has awarded Dr. Papier a $2 million grant to develop a standardized lexicon for dermatology. Moreover, VisualDx boasts of customers such as the Military Health System, Delaware Division of Public Health, Wyoming Department of Health, and many more. Long story short – we trust them. Upon finding and clicking on a condition in the differential (shown above), the user can access an image bank of the condition, as well as the ICD-9 and information such as diagnostic pearls, differential diagnosis, best tests, management pearls, therapy, and associated findings. All of this information is grouped together into one screen and indexed on the right side of the screen, allowing for easy navigation between sections. 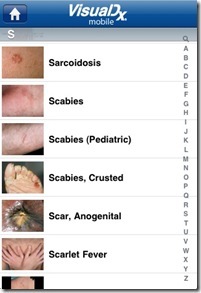 The other function on the home screen is the “Find a Diagnosis” function (shown below), which allows a user to browse or easily search for one of over 1000 diagnoses to see the associated bank of images and reach the aforementioned information about the condition. As a fourth-year medical student and soon-to-be internal medicine resident, I was very impressed with this app’s clinical utility, as it makes for a infinitely useful tool both in outpatient and inpatient settings. 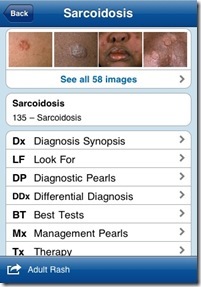 It is quick-loading, intuitive to use, and can prove to be a powerful source of help for identifying the many skin lesions that one is bound to see in any setting. The most useful facet of the program is, not surprisingly, the “Build a Differential” function that shines when one encounters a skin lesion. 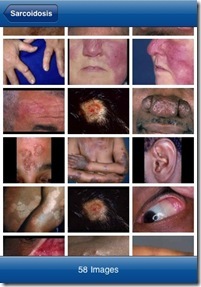 Though I did not come across any unknown skin lesions this week (unusual), I employed it several times on patients of mine with known dermatologic conditions and was pleased to discover that it included the correct diagnosis among the first several conditions on its generated differentials. 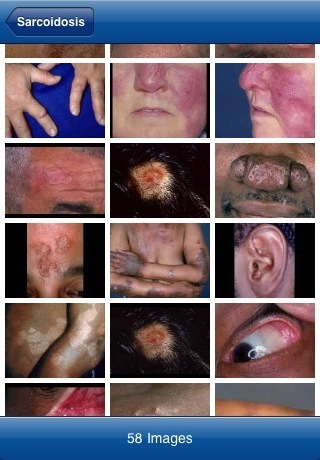 From there, the images were high-quality and helpful in proper diagnosis. Moreover, it has great potential for patient teaching or interaction, especially for warning about drug eruptions or assessing transient or historical skin lesions. 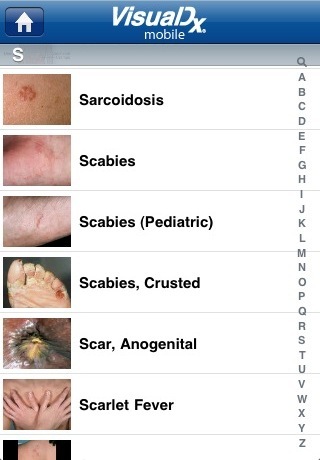 Unfortunately, the differential diagnosis resets if one exits the app. Nonetheless, I absolutely plan to use this app as a resident, especially for the many clinic patients I will undoubtedly see with dermatologic complaints. Pricing: Current VisualDx subscribers can download this app at no cost. A free trial (of 15 days’ duration) is available for clinicians who are new to VisualDx. After that, a one-year subscription to VisualDx costs $199 (or $49 on student pricing) for the Clinician Package, or $99 (or $29 on student pricing) for the Pediatrics Package, which limits the features to neonate/infant/child lesion(s). 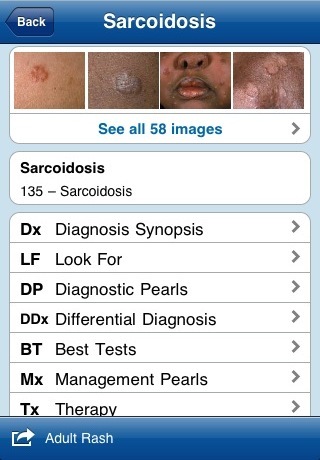 Conclusion: A powerful app, almost a must-have in my opinion, with a tremendous user-friendly interface, for a medical student or resident to help evaluate dermatologic lesions in both inpatient and outpatient settings. Amit Patel is a fourth-year medical student at Washington University in St. Louis, MO. He is a graduate of Duke University and will be entering an Internal Medicine residency this July. We are thrilled to have Amit aboard! It could certainly appear complicated, but we’re confident that this app will be very useful to clinicians – it condenses an enormous library of information into what is actually a pretty simple interface. So I would definitely give it a try.